Although a short week, we had lots of activities going on this week at The Gan! On Tuesday we spent some time watching the building of the sukkah. Then we went inside and built our own sukkah in the play area with the pipes. Later in the morning we made the walls and added the sechach. This was then available on Wednesday to play with and we even had people and a table to use in it. In the meantime, we also sorted colored items and sukkahs in our math area, worked on our Sukkah book pages in writing, and even made sukkahs out of popsicle sticks. On Wednesday we received a big box that we made into a classroom sukkah by cutting a door in it, decorating and painting it. Throughout the entire week, one of our morning exploration activities was making paper chains for decorations. However, the children were supposed to put the pieces together in a pattern. Before we painted the sukkah we experimented with primary color mixing and eventually learned that yellow and red make orange and orange and blue make brown. 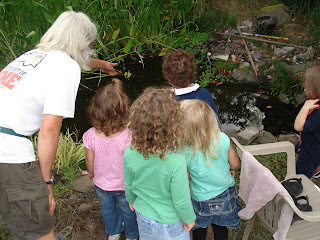 There was also a container of nature that was brought into the classroom for the children to use the science tools to look at and learn about it. We also continued our pattern learning by using apples and bananas during snack one day to make ab and abb patterns before eating them! Morah: What’s the next holiday? Morah: And…what do we do on Sukkot? Mussies: Uh…we build a sukkah. Morah: We build a sukkah. Mussie: We have a real sukkah! Levi: Those look like ice things. Morah: You are right Levi. They look like they are from popsicles because they are called popsicle sticks. What do you think we can do with popsicle sticks for sukkot? Mussie: We could build them like a sukkah or a chuppah. Morah: And what do you think we need to use with it? Morah: So that’s in the art area for our art activity. What do you think these are? Mussie: Oh that’s little ones. Morah: These look like little sukkahs but they are not really. They go inside the sukkah. What are they? Mussie: A window. A door. We go through our door in the backyard cause we build our sukkah in the backyard. Morah: And sometimes we put things on it, what do you think it could be? Morah: And what are these that I am putting on the table? Morah: They’re candles. Good job Levi. And what’s this? Mussie: A chain for the sukkah. Morah: This is going to be at the math area. Mussie: Can I go to math today? Morah: Maybe. What is going to happen is you are going to sort the items to go with the correct sukkahs. And then look. Do you know what that says? Morah: So you also need to match the words. One of the other things I want you to do is … look what I brought in. You can use magnifying glasses and the scale when you look at these. I also made special papers that we are going to use to make class pages about the sukkahs. Next week we are going to focus on some more writing of letters and working with numbers 1 to 7. The children will have the chance to experiement with feather writing as we also talk about the celebration of Simchat Torah. As the Jewish New Year is officially upon us and Yom Kippur just about here, this week we focused on friends and mitzvot. Throughout the week we had many reminders of what it means to do mitzvot, whether you are a friend at school who sits next to someone who is sad, a little mouse who helps an animal (who is usually mean) in the swamp with a sore tooth, or a person who gives tzedakah. We have a few friends here at the Gan who are really remembering their tzedakah everyday for circle time. And we keep reminding all our other friends to try to remember to bring some on a daily basis! While learning how important it is to give tzedakah to help others, we did a math exercise with pennies. The children were able to match pennies to circles, color in the circles, count the pennies (as they placed them in a pretend tzedakah box as since we were using fake pennies) and then trace and write the number of pennies. This seemed to be a favorite activity of the week! We also had many activities about friends. We made friendship bracelets and one day we made enough to put one in everyone’s mailboxes. This was a nice surprise for the children to all find that they had mail! We also drew portraits of our friends, play in blocks or home living with friends and even made pages about why we consider each child in our class as a friend! These pages are displayed on one of the boards in the entry way to the classroom! And although we normally do not play with our food, the children were given different pieces of fruits and vegetables to make friends during snack time. 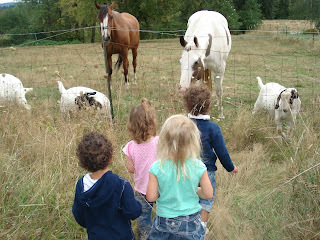 After making the friends, the children ate their friends and asked to do more “food playing” activities in the future! During circle time this week, Morah Tzivie led us in a discussion about thanking Hashem for things. Here is a glimpse at that conversation. Morah: What do you want to thank Hashem for? Jayden: My mommy and my daddy. Levi: Hashem gave us food. Mussie: For giving us the Torah. Morah: I thank Hashem for letting me come to school every day and see my friends. That makes me happy. What makes you happy? Morah: You can thank Hashem for everything that makes you happy. Jayden: Giving my daddy money. Josh: Giving my mommy money. We also had a fun conversation before making our people at snack time. Morah: What have we been talking about? What did we make in the art area this week? Morah: What have we been talking about this week? Morah: Yes, we talked about our fish. What else? Morah: The tzedakah activity. When we give tzedakah, what are we doing? Mussie: We are doing a mitzvah. Morah: And what’s so important about doing a mitzvah? How are we treating others? Do we want to treat others nicely? Morah: Who is an easy person to do something nice for? Morah: Who at school would be the easiest? Next week we are going to focus on Sukkot. We have many fun activities that revolve around making sukkahs and items for the sukkahs! The gift of Shabbat comes to our home once every week. It brings with it a time for peace, joy and family celebration. For more than three thousand years sundown on Friday was welcomed in Jewish homes with the traditional Shabbat Candle Lighting and reciting of the Kiddush (a special prayer invoking holiness) over wine and challah. On Saturday night at nightfall, the Shabbat was brought to an end with the Havdalah ceremony. At The Gan, we strive to enable your child to appreciate and enjoy our wonderful traditions. We join with you in giving them the opportunity to bring the joys of Shabbat into their world. Each week one of the children in The Gan will be given “The Shabbat Box” to take home for the weekend. Our beautiful box includes a silver Kiddush cup, 2 candle stick and candles, a home baked challah, a challah cover, the blessings and a journal. The box is to be returned to school on Monday (or Friday for the Mommy & Me participants) and your child will have a chance to share his/her journal entry with the entire class. Another week at our new school and a celebration of a new year! We have been enjoying a great week of school. We started on Monday with talking about apples and honey and how that represents a sweet new year! We also made "Shana Tova" cards that are being mailed to the Grandparents. On Tuesday we added our apple growth chart to the wall. 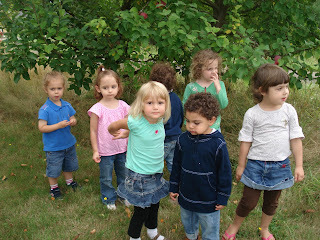 Now we know how many apples tall each child is as well as their height in inches. 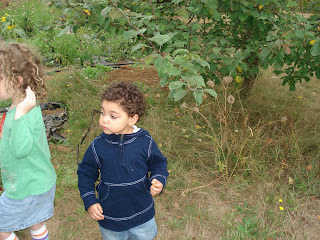 On Wednesday we celebrated Jayden's 4th birthday, we went to an apple farm and tasted apples, pears and tomatoes and we heard the Rabbi blow the shofar and then everyone had a chance to try to blow the shofar! It was really a full day. On Thursday we were able to see an actual beekeepers outfit as we talked about how we get honey to eat with our apples. We also took a walk to the mailbox to mail our cards. And on Friday we will be having our first Shabbat celebration with music! In the writing area this week we worked on our cards. In the math area we talked about our growth chart and also did apple math puzzles. We had our first sensory bucket activity for science, where we were able to play with water and water toys as we thought about tashlich. In the block area we built beehives and in the home living area we pretended to cook with apples. Mussie as a beekeeper with a bee! When we sat down for snack on Monday, we had a discussion about apples and honey. Here are a few of the conversations. Morah: What do apples taste like? Lizzy: Red, I like green apples. Avery: I like orange apples. Morah: What color are apples? Miriam: I have seen purple apples. Levi: I've seen blue apples. Morah: Have you ever seen apples on a tree? Avery: I don't like honey. Morah: You don't? What other fruits are sweet? Pears, apples... What other foods are sweet? What other foods are sweet? Are pickles sweet? Morah: What does it taste like? Apples dipped in honey? Morah: What else tastes sour? Miriam: Candy. At first it tastes sour. Another conversation that was recorded was during our birthday celebration for Jayden. The children were asked what is special about Jayden. Here are their answers. Lizzy: We like him and he's a good boy. Mussie: He listens to the Morah. Lizzy: He shares with us. Miriam: I play with Jayden and he wants to play with me. Josh: My big brother is Jayden. Next week we will be focusing on our next holiday, Yom Kippur. Our theme of Yom Kippur is going to be partnered with a look at friendship. We will be talking about our friends and what it means to be friends.